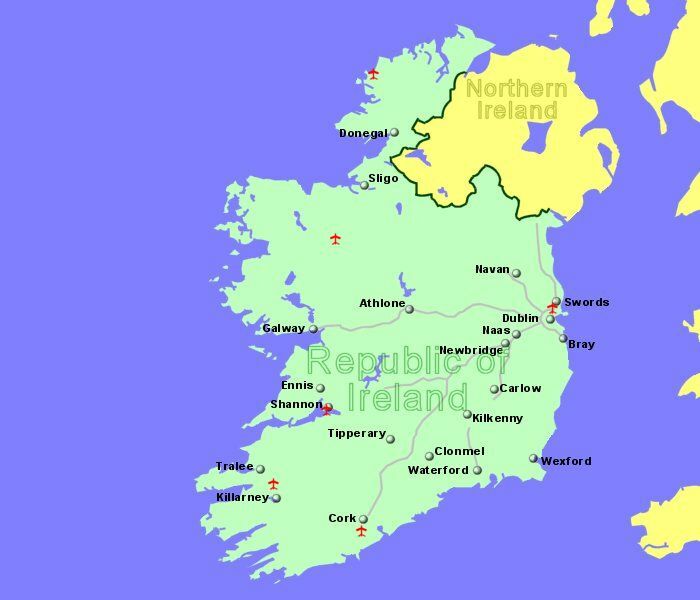 Through our continual research, we are able to list all the airports in Ireland and the United Kingdom that have flights to the rest of Europe. For each airport we give a guide to facilites avilable, location map, other nearby airports, airlines that use that airport for departures, and the European countries they fly to. 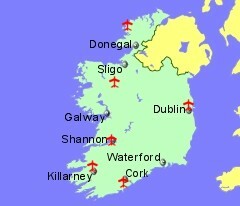 3 Dublin Airport (DUB), Ireland, 27 Airlines Listed Located 10Km North of Dublin, close to the M1 and M50 motorways, on the east coast of Ireland. 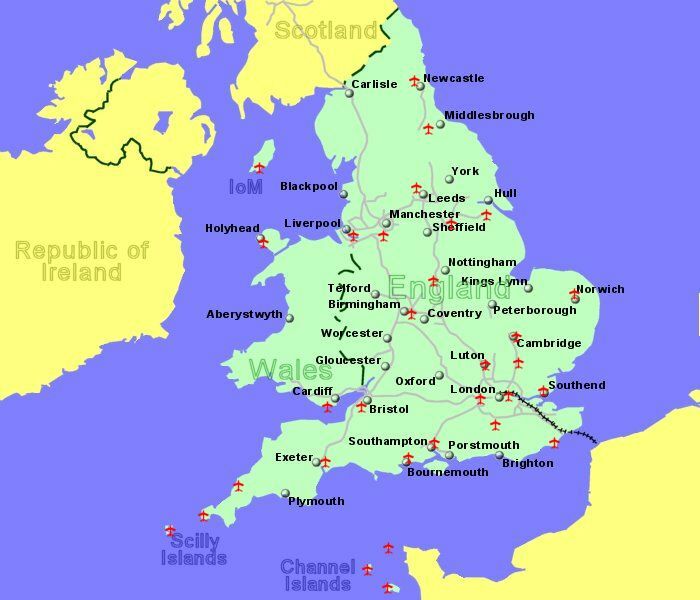 12 Anglesey (Valley) Airport (VLY), UK, 1 Airlines Listed Located 4 Km south of Valley, on the west coast of the island of Anglesey, off the north west corner of Wales. 17 Birmingham Airport (BHX), UK, 25 Airlines Listed Located 13Km South East of Birmingham, next to the National Exhibition Centre, close to the M42 and M6 motorways giving good access to a large part of England. 21 Cambridge Airport (CBG), UK, 2 Airlines Listed Located 3Km east of Cambridge centre, 80Km north of London. 24 Carlisle Lake District Airport (CAX), UK, 1 Airlines Listed Located 10Km north east of Carlisle, Cumbria. 29 Doncaster Sheffield (Robin Hood) Airport (DSA), UK, 5 Airlines Listed Located 8 Km south east of Dancaster, close to the M18 motorway. 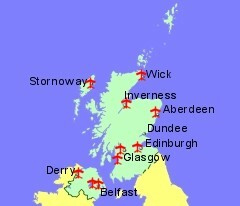 33 Eday Airport (EOI), UK, 1 Airlines Listed Located on the island of Eday, the Orkneys. 34 Edinburgh (Turnhouse) Airport (EDI), UK, 26 Airlines Listed Located 13 Km West of Edinburgh, south east Scotland, adjacent to the Royal Highland Showground, 1.5Km from the A8. 35 Exeter Airport (EXT), UK, 5 Airlines Listed Located 8Km East of Exeter, close to the M5 motorway, south west England. 36 Fair Isle Airport (FIE), UK, 1 Airlines Listed Located on Fair Isle, Shetlands, between Shetland mainland and the Orkneys. 45 Jersey Airport (JER), UK, 10 Airlines Listed Located 7 Km north west of St Helier, the capital of the Channel Island of Jersey. 53 London Heathrow Airport (LHR), UK, 27 Airlines Listed Located 24Km West of the centre of London, close to the M4 motorway and with good rail links into the city. 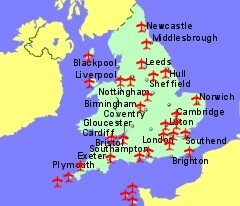 57 London Stansted Airport (STN), UK, 18 Airlines Listed Located 48Km North East of London, close to the M11 motorway. 62 North Ronaldsay Airport (NRL), UK, 1 Airlines Listed Located on the island of North Ronaldsay, north eastern Orkneys. 65 Papa Westray Airport (PPW), UK, 1 Airlines Listed Located on the island of Papa Westray, the Orkneys. 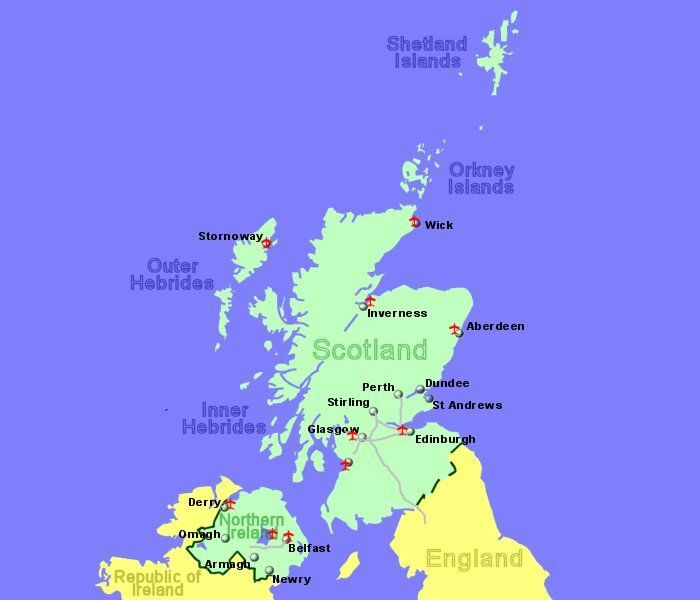 73 Stronsay Airport (SOY), UK, 1 Airlines Listed Located on the northern tip of the island of Stronsay, Orkneys. 75 Westray Airport (WRY), UK, 1 Airlines Listed Located on the northern tip of the island of Westray, the Orkneys. 76 Wick (John O' Groats) Airport (WIC), UK, 2 Airlines Listed Located 2Km north of Wick, at the north east extremity of mainland Scotland.